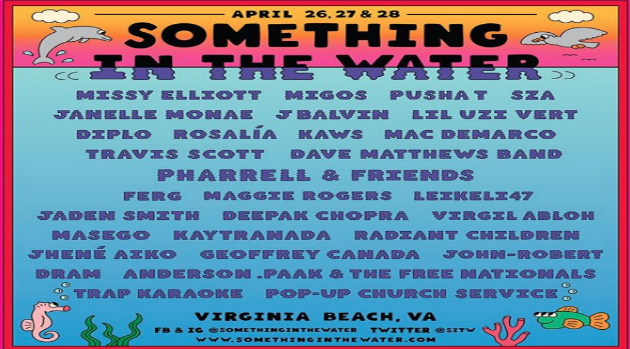 Courtesy of Something In the WaterPharrell has announced his newest venture, Something in the Water, a multi-day music festival and cultural experience in his beloved hometown of Virginia Beach. Monday, the seasoned producer and recording artist unveiled the stacked line-up for the three-day event that is set to take place April 26-28. The stage will be set on the beach and feature performances from Travis Scott, Migos, Dave Matthews Band, Missy Elliott, Janelle Monae, SZA, Lil Uzi Vert, and more. Additional performers include Anderson .Paak & The Free Nationals, Pusha T, Kaytranada, Ferg, Jhené Aiko, Masego, DRAM, Leikeli47, and Jaden Smith. According to a press release, the festival’s sole purpose is to unite the community and celebrate the diversity and magic of Virginia Beach. The weekend-long event is also set to include a special screening and conversation with Ava Duvernay, introspective moments with Deepak Chopra and Geoffrey Canada, as well as a Pop-Up Church Service and TRAP Karaoke. Tickets for the first ever Something in the Water will be made available for purchase beginning Friday at SomethingInTheWater.com.